I love snarky and sarcastic people. I've found that it takes a certain amount of wit and intelligence to pull off the attitude with flare and personality and although I'm far too tenderhearted to be a mean person, I can't help the little snicker that comes over me now and then when I watch those that -are- snarky jab on in on a close minded idiot. Maybe that's why I like today's shop so much, they pull this off with flare and personality. Flytrap's logo is "We make smart people laugh" and honestly? I can't help but agree with this. The shop's filled with snarky (and sometimes mean) greeting cards, little mini notes and paper gifts for those not into the whole "rainbows and kittens" thing that Hallmark has going on. 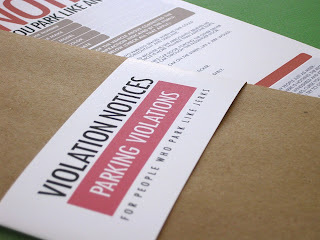 They even have funny, fake parking tickets for people who park like jerks! They're official looking and perfect for those times when you just know it's not right to key a car or poke a hole in the tires. This is my absolutely favorite thing in their shop, but it's a hard distinction to make, because so much of their shop is so perfectly amusing that you just don't want to pass up! YOU CAN CLICK ON THE PICTURE ABOVE TO VISIT FLYTRAP'S NEATTHINGS ETSY SHOP AND TAKE A LOOK AROUND OR, IF YOU PREFER, CLICK RIGHT HERE. First off, your blog is as beautiful to look at as it is fun to read. Love the flytrap story. Anyone who uses the word snarky and makes money from it gets a big hazzah from me! LOL! great feature! awesome shop! Thank you for finding this hilarious shop! I hate traditional greeting cards so these are perfect! Just hearted their shop. Thanks for finding it!! It's hilarious! I already had this shop as a favorite! I think I saw it in a treasury, but I want the parking notes!! I just love things like this! I had a friend in high school who made a bunch of things like this, kept them in his wallet, and passed them out whenever he felt it was necessary! Glad someone else has taken the idea and run with it! We can all use a better sense of humor!! What a clever shop. . . I can think of a million places in Seattle where the fake tickets would come in super handy! as said, "sarcasm may be the lowest form of humor but the highest form of wit"